What exactly are insects, and why should we care that there are almost a million different species of them? In a fast-paced, jovial style, Sneed Collard tells us this information and more! Covering basic bug facts (hatching, growing up, defenses, diet, etc. ), this volume introduces readers entomology using fantastic photographs and an amusing, conversational tone. While I am normally annoyed by phrases like “Righteous exoskeleton, dude!”, these fun phrases really helped lighten the tone of the book and kept me reading! Young readers who are interested in insects will eat this up like a deep fried termite, and those reluctant to pick up a nonfiction book will be drawn in by the close up views of insects and and the interesting information. This book had a great balance of pictures and text, with some informative sidebars providing further information and anecdotes about particular types of insects. The photography is excellent, making this a great resource for classroom teachers; I can see chapters of this being read aloud to accompany a science class unit on insects. There is enough information that this could be used for research projects, and it’s also great fun just to read. Finding a nonfiction book that fits all of these uses is an extremely rare occurrence! 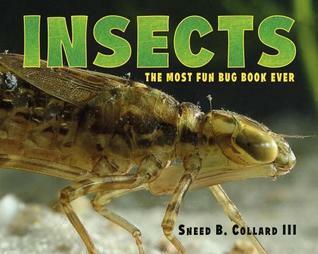 Collard doesn’t just provided information about insects; he makes sure to tie this information into reader’s daily lives. He encourages them to go out and look at insects in the world around them and emphasizes the need for everyone to be knowledgeable about the world around and the impacts that humans have on it. This book is an essential purchase for elementary and middle school libraries. See more Middle Grade book reviews at Ms. Yingling Reads.